Compusoft Engineering was responsible for the structural concept, structural rigging design, fabric design and fabric patterning for this world reknown sculpture. The type of fabric used was Ferrari 1302. 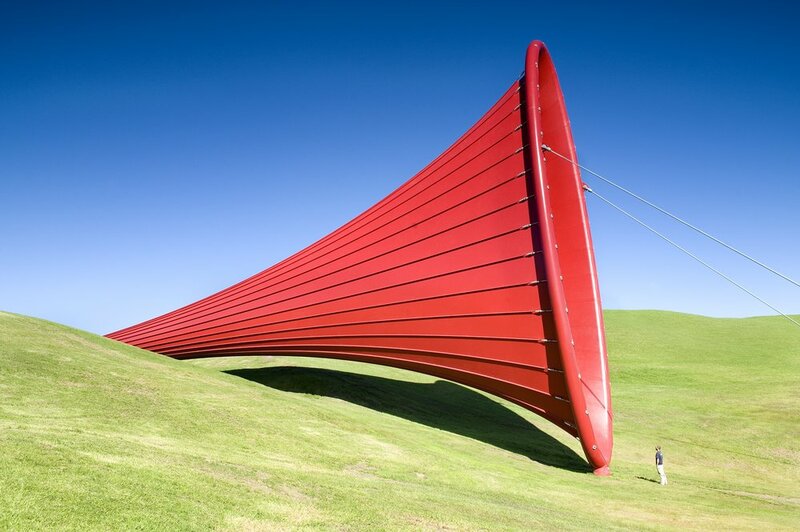 This award winning eighty five metre long tensioned fabric sculpture is one of the world’s most extreme fabric structures. Supported at each end by elliptical steel rings, twenty seven metres across, this structure is tensioned longitudinally with fifteen tonnes of prestress. The unique cable pockets that provide the ribs of the sculpture were designed to minimize fabric stress and laboratory tested to prove their behaviour. The use of light weight, high strength aramid fibre cables enabled the installation and erection of this unique structure to be completed in four days. The Auckland International Airport forecourt drop-off canopy forms a raked barrel vault that is cantilevered from primary posts located at 9.5m centres. The posts are set out on a gentle radius to suit as much as possible the geometric layout of the adjacent drive lanes. The rake of the canopy profile is defined so as to ensure the height clearance defined in the Architect’s intent drawing is maintained. Compusoft Engineering used a specialist 3-dimensional non-linear large displacement finite element analysis program to analyse the load distribution within the fabric membrane, cables and support assemblies. This program transmits the surface pressures and pretensions in the membrane to the supporting elements taking account of its geometric non-linear behaviour. 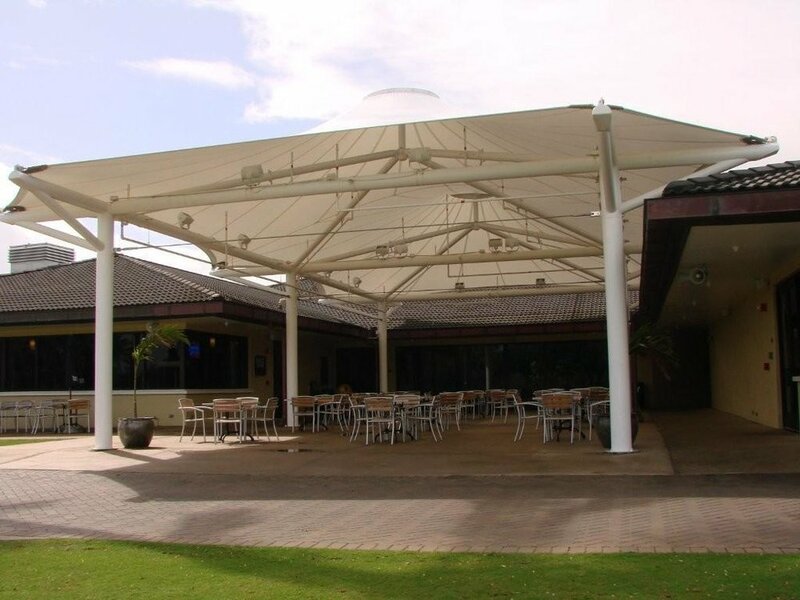 This standalone double cone canopy provides the original Klipper Clubhouse building with an additional outdoor alfresco dining experience unsurpased on the base. 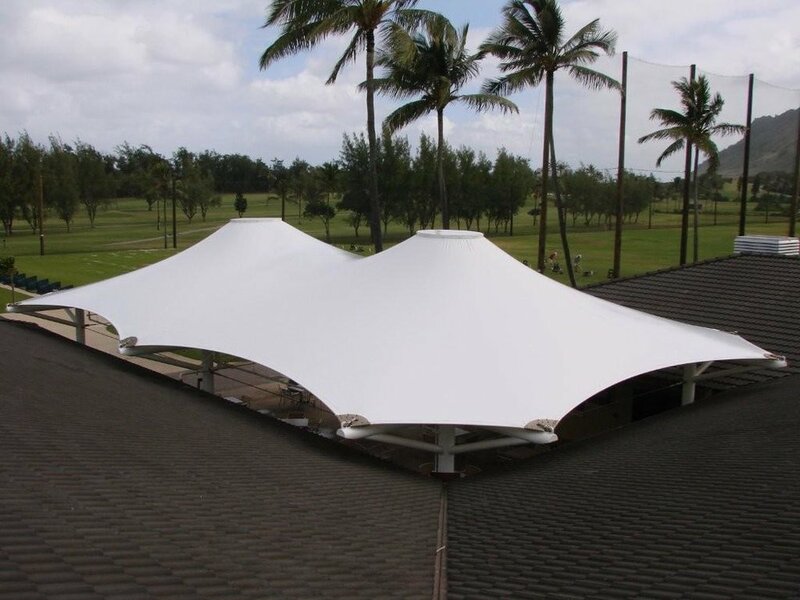 Built to the US Navy's strict criteria, the canopy is designed by Compusoft Engineering to withstand the high winds common place in Hawaii. The 22m x 14m structure is supported independently from the existing building by 6 columns which enabled the structure to be installed with minimal disruption to the clubhouse building operations. The stainless steel frame comprises of two symmetrically located central bale rings, each supported off four struts, in turn supported off 6 columns detailed to act as moment resisting frames. The fabric design and structural engineering of this structure was the responsibility of Compusoft Engineering. Located at the gateway to Waiheke, this tension membrane structure provides an economic yet attractive protection to passengers transferring to and from the Matiatia ferry terminal. Analysis and design using an integrated approach based on the SAP2000 analysis package resulted in achieving a slender and efficient design solution.